We are an Austrian IT consulting company located in Haitzendorf, Lower Austria, near Krems an der Donau. 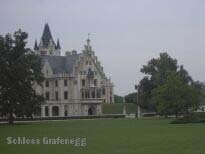 The village between the Wachau Valley and the Kamp Valley belongs to the well known wine- and culture village of Grafenegg, some 45 Minutes away from the capital city of Vienna. A second location is our development office in Vienna. IT professional Hubert Sefkovicz. The company is successful business partner of IT manufacturers and IT customers in planning und implementing innovative made-to-measure IT solutions. Main business focus is on the healthcare sector, and here mainly on the special field of integrated hospital information systems (HIS). Depending on the nature of our tasks we take in additional support from external specialists. Regular freelance expert is Andrea Kovacic, MSc, MBA, a graduate in business management and business psychology. Big IT projects are jointly realized with cooperation partners. Our own tasks mostly are systems analysis and planning, project management, and quality assurance. We are mainly active for enterprises and institutions in Austria and Germany. Furthermore, we have business relations to enterprises in the new EU member states and, since 2005, beyond the EU too. We consult our clients at all company levels, we conduct analysis tasks and studies, we develop IT solution concepts and IT strategies and manage development projects and organization projects of quite a different kind. We are known and recognized beyond the German-speaking region as IT experts for the healthcare sector, and so in the recent years a growing international broadening of our consulting activities arose. Meanwhile we are active in international professional boards for medical engineering too and use the opportunity to diskuss our concepts and strategies with an international expert audience. We can benefit a lot from the additional experiences we make thereby, and our clients can benefit with us too. When Hubert Sefkovicz presents lectures in the course of international expert events, he has a similar goal. In the field of e-health a rapidly increasing need for a much higher integration of the medical, medical engineering, and administrative IT systems can be seen for the next years, and with our special expert knowledge we are yet ready for that. We are closely watching new trends and developments. When it makes sense, we are among the technology leaders with our concepts and combine proven solidity with the state-of-the-art and with foreward-looking innovations. We go new ways too in supporting medical measures by special interdisciplinary IT solutions. We design and develop special software for the professional clinical and semiprofessional use and provide completely new possibilities for the healthcare sector and the wellness sector.